In an otherwise empty gallery space, six reflective panels are positioned in a ring, facing inward, catching one another in their reflection, creating channels of infinite regress. A dancing figure in the form of a spiraling flurry of silk appears within a reflective frame, disrupting the mirrored image, and moves from one panel to another, seemingly crossing the space that spans between each. As the figure traverses the circumference of the ring it appears infinitely in the cross reflection, where viewers and the dancer appear to share the same physical space. 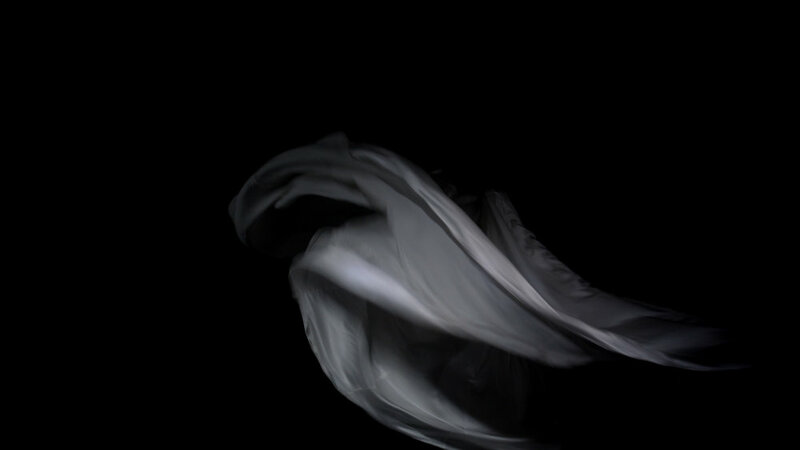 The movement of the dancer is reminiscent of Loïe Fuller’s serpentine dance of the 19th century. Fuller was a choreographer, costume designer, dancer, and an inventive stage designer published in Scientific American. Credited as a pioneer of modern dance, she used her voluminous robes as a performative sculptural object, radically positioning dance within a conceptual realm. The choreographed movement of the dancer’s robes in this installation, create metamorphic and ephemeral sculptural structures that pass through shifting tones and colours. A trail of mercurial forms emerge from the silk robes, tracing its movements, vivid, and fleeting, the structures grow as tendrils that delineate her path and diminish in her wake. Viewers are invited to explore these structures as augmented reality, using viewing devices provided by the gallery.